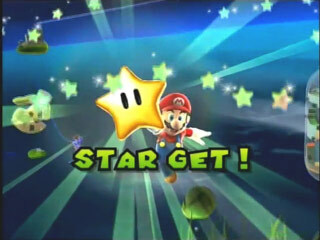 The Japanese Super Mario Galaxy announces "Star get!" 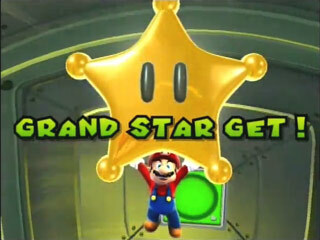 when you get a Star, and "Grand Star get!" when you get a Grand Star. 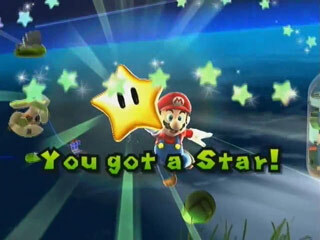 In the U.S. version, the grammar was cleaned up to read "You got a Star!" 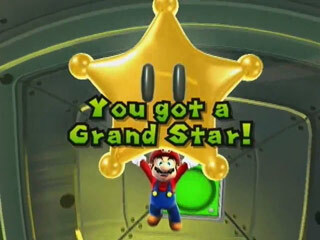 and "You got a Grand Star!" A similar change occurred in Super Mario Sunshine, where "Shine get!" was changed to "Shine!" Note: The Japanese names are sourced from the game text and official Nintendo player's guide. The English names are sourced from the game text, manual, and the SMG trading card set released by Enterplay. Ray: "Mantarō" is a combination of manta and -tarō, a common male name suffix. クッパJr. Kuppa Jr. Koopa Jr. Bowser Jr.
Baron Brrr: This boss is called "Baron Brr" on his trading card. Electrogoomba: "Takobō" is a combination of tako (octopus) and "Kuribō," the Japanese name for Goombas. They were renamed "Octoombas" in Super Mario Galaxy 2. Kingfin, who resides in the Bonefin Galaxy, is called "Bonefin" on his trading card. Major Burrows: "Mogu King" comes from mogura (mole). Piranha Plant: The purple, thorny Piranha Plant is called Spiky Piranha Plant in the Super Mario Galaxy 2 player's guide by Prima. Pokey: The "Coco" in its Japanese name comes from coconut (kokonattsu).